Ken Armstrong Writing Stuff: Haiku Would Your Help Be With This? Haiku Would Your Help Be With This? Okay, I won’t gild the lily. I could use a little creative help here. I’ve been asked to do something ... one of my more spectacular failings is that I find I hard to refuse anyone who asks me to do anything. (Please use this information humanely) . In particular, when someone I love asks me to do something for them, I find it impossible to refuse. No, that statement doesn’t quite tell it like it is – When they ask me, I don’t even want to refuse. So my beloved Linenhall Arts Centre have asked me to do this and I don’t even dream of saying ‘No’ because I 'heart' the Linenhall Arts Centre in a great big way. The Linenhall is my town’s Art Centre, and they have supported, entertained, and befriended me ever since I came to live here in Castlebar. They have premiered - what is it now? – five of my theatre plays. I have appeared in three plays there (none of them my own) and I… just love the place. That’s all. So, The Linenhall have a programme of events for Culture Night next Friday night – 25th September 2009 - which is part of a nation-wide endeavour to get more of the general public involved in ‘culture-stuff’. The Linenhall will be crammed with diverse events and opportunities for fun. You should come along. You’ll know all you need to know. A good deal or what? My brief is to show the good people of Castlebar how they might go about writing a Haiku poem in fifteen minutes or less… it wasn’t my idea but it’s not a bad one and that’s mainly why I will do it. I reckon I will have a little ‘stall’ or corner of a room where people can come and talk Haiku and hopefully give it a go. I have several valued readers who are themselves established and talented poets and I hope they won’t look too dimly on my little excursion into this territory. Jim Murdoch has written well on the subject, as he has done on so many subjects. Sorry Jim. Allow me to be the first to clearly state that you could fit all that I know about Haiku in a Haiku. I know this and Marie Farrell, the Director of The Linenhall, knows it too. But she’s a smart cookie, is our Marie. She knows I have an enthusiasm for writing which I’m passably good at sharing, that I will approach the subject from the basement up and that I am brilliant at taking the piss out of myself. These are the qualities that I hope will carry my Haiku evening off. But, like I said, I would sure welcome some input from you guys. We did it a few times before, with Limericks 1 and Limericks 2, and they were a blast. Could you write me a Haiku in the comments section or else, tweet me one. If you let me, I will use them on the night to help illustrate how a toe can be dipped in the Haiku pool by simply expressing yourself within the confines of the most basic of Haiku rules. This may seems frivolous and perhaps downright disrespectful to some but I actually have a serious writing point at the back of my head. I firmly believe that creative writing can be strengthened by the at-least occasional imposition of confines upon it. There! Take a blank page and write anything – it might well be great, it will probably be crap. But nail yourself to a subject and a point of view and a timescale and a tone and a setting and… the end result will be more focused, considered, and points will arise along the writing of it that you never thought would occur. Anyway, I’ve lost you, I know. If you’re still here, please write me the simplest of Haiku – three lines, 5 syllables in the first, seven in the second and another five in the third. Tweet it or comment it and let me use it for Friday – all copyright remains with you of course – it’s not really Haiku at all but it’s a toe in the door of the form and that, for now, might be enough. Look, I’ll have a go at a few, ‘top of the head. Shoegal007: Wow, that's really good - did you just write it or is it a long-created piece? Dave: This will be posted above me head at my Haiku stall. Thanks so much. Slumped at the laptop, pneumatic drill hangover, writing a haiku. Underground rumblings. Overground serenity. Dig a hole for light. Clapping at wee wees. Pretending to call daddy. This is my life now. Hot, black and steamy; the glory in my morning; but it's just coffee. My coffee machine is the essence of morning time joy and real pleasance. and it brings on a touch of tumescence. Mongoose gathering. In black and darkening crew. Inside the sun remains. Ken will show you how. .... course, I nearly retracted after reading that your espresso was a "bless-oh" ... oh Ken!!! On the Limerick, it's kind of like the word 'Blessing' was interrupted mid flow as a new thought occurred - a thought that made me go 'oh'. Try it for a lark. It won't hurt too much, honest. but it’s easier counting haiku! to lend a thought to my prose. Yeah I got it but still burst out laughing at 'bless-oh'. And, forgot to say I'll be lighting a candle for you on Friday night! I hope it's smashing. And, I'm glad you mentioned this because it would be a fun thing to do with my son I think. I'll write some with him tomorrow and see what he comes up with. AND as a participant in Silly Haiku Wednesday, mind if I haiku your impending success as my upcoming-Wednesday entry? Sure you don't mind. Thanks! You're welcome to use some of mine published in the Night and Day anthology by New Island 2008 all about working in an office. I wrote three of them in my latest post. I'll paste one here. unwilling to speak up now. I've never been very good at haiku. I have a grand total of one that's made my canon. It was the 5-7-5 format that really put me off. Since I've discovered that that isn't a requirement I've been a bit more open to them but it's far easier to write a bad haiku than a good one I find. Anyway, for you, this is what I did. As soon as I'd read your post I looked at what I was doing, listening to some choral music, and decided I'd spend 15 minutes writing about that and see what I could come up with. What you've got here are four haiku. I tweaked a couple of them to fit the 5-7-5 format but they became unnatural so I've left them as they stand. I think what's interesting about them is a progression of thought around the idea of life and death. I aimed to incorporate a nature theme to keep with the spirit of the haiku and three of them have it. Catherine: This will set the tone for Friday night, I feel. Carrie: Thank you and Hi! You've touched on something I feel - the exercise of writing as many as you can in an hour has got to be a great one. The basic rules make it really easy to write one and that's got to mean it's really easy to write a bad one. Writing loads should mean that some good will distill out of it. I feel it's a good approach although I feel many deep thinkers would pooh-pooh the notion. Emerging Writer: I really appreciate that, thanks. I really like Mark and Phelim. Jim: I really appreciate the time you've taken on this and, to my great pleasure, I think you've produced a wonderful musical work in haiku verse. I hope you keep it. With your permission, I will show it to my visitors on the night. (Just starting into your book... more soon). will learn to be creative. hide what's on his mind. when her book is read? Make what you will of that one. I posted your link to the blog for tomrrow's schedule. I would have written that in haiku but my eyelids are starting to stick to my face. A sure sign that I've been sitting here long enough. Limericks take a whole three. In the middle spill seven. 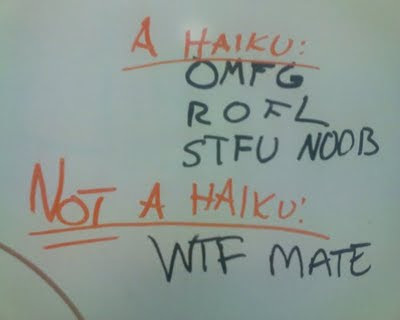 I've loved haiku since High School English class. Limericks I just can't get the hang of. I've never written a haiku...just never fancied it before. But for you...well, we're old friends by now right? I really liked Carrie's ones above and Hope's and the John Cooper Clarke. I love a challenge but am the first to admit that I stink at poetry. Add new fridge to list! A friend gave me a book called 'The Haiku Anthology' (edited by Cor van den Heuvel). I never even looked at it before but had a peek today. It has a very good introduction about haikus which you could perhaps do with reading before you start on this new stage of your career! Thanks again guys... it's Haiku workshop time. Nice, but could you rewrite that in the form of a Haiku? So. With your wonderful help, I got through Haiku evening and had a lot of fun. Four 15 minutes sessions. I had all your Haiku printed off and posted on the wall. They were perused with great interest. I advocated writing many Haiku and overwriting them then paring them down. I also forwarded my own feeling that the final 'line' effectively offers a counterpoint to the first two and that it is a great start to idenitify this counter point. This often presents the theme of the first line with the second becoming a sort of 'bridge'. So try writing the last line first, then the first and see what happens. People were interested and kind and you guys were life savers - thanks again.